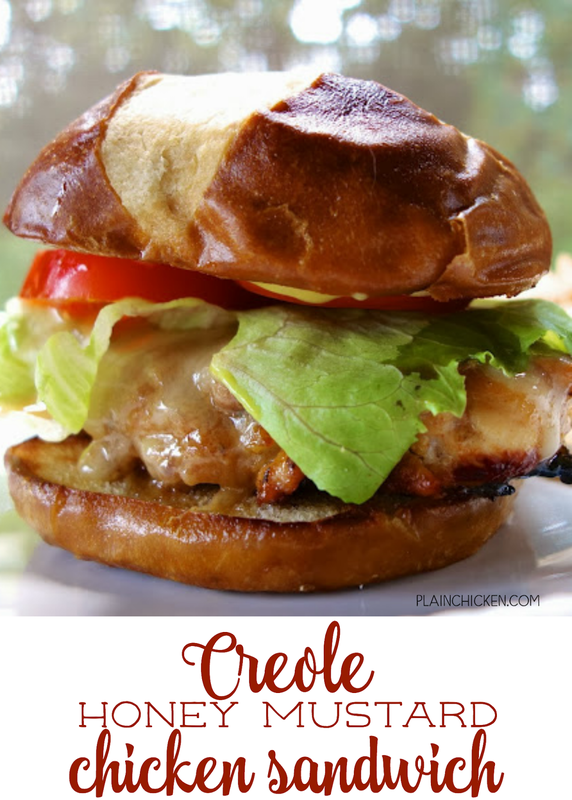 Creole Honey Mustard Chicken Sandwich Recipe - chicken marinated in dijon mustard, honey, lemon juice and cajun seasoning - grill or pan sear chicken, top with cheese and serve on a pretzel bun. 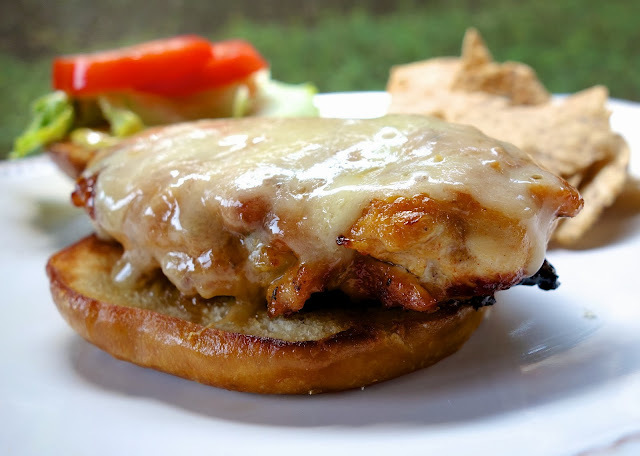 This is my favorite chicken sandwich - better than any restaurant! This is another recipe I can't stop thinking about. This chicken sandwich was SO good. I loved everything about this sandwich, especially the pretzel bun! I think I would eat just about anything on a pretzel bun. I found these larger pretzel buns at Earth Fare. That is the only place that I have found them. If you know of other places, let me know! The chicken is marinated in a mixture of dijon mustard, honey and Cajun/Creole seasoning. I used some of the seasoning I picked up in New Orleans. It was delicious! We ate this for lunch and it was better than any chicken sandwich I've had in a restaurant. I can't wait to make this again! Whisk together seasoning, dijon mustard, honey and lemon juice. Pour over chicken and marinate for several hours, up to overnight. Heat a tablespoon of oil over medium-high heat in an oven safe skillet. Cook chicken 3 minutes on each side. Place skillet in oven and bake an additional 10 minutes. Top chicken with cheese and return to oven to melt. 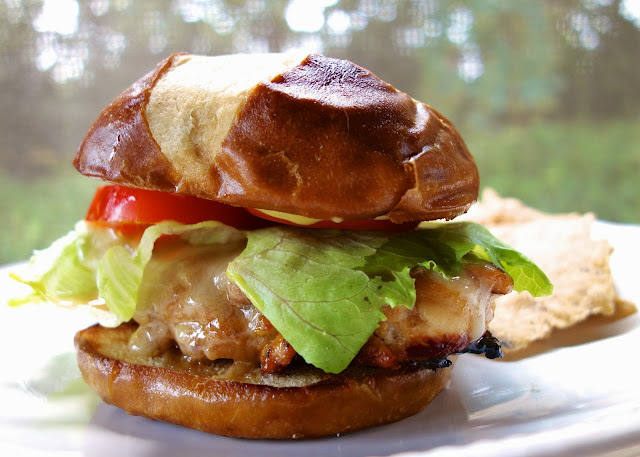 Serve chicken on pretzel bun with lettuce, tomato and honey mustard dressing. Now that is a yummy sandwich! I really love pretzel buns! That looks amazing! Can't wait to try it. I haven't been to Earth Fare, but it's pretty convenient to us. Is the pretzel bun crunchy on the outside, or softish? Since Nathaniel is still in braces, something as crunchy as, say, French bread on the outside is still a no-no for him at this point. I might still have to stick with a regular bun. The pretzel bun is soft. I like to put some butter on it and toast it in the skillet. Not a fan of the pretzel bun, but the chicken looks good! I am in love with the honey mustard recipe used on another chicken recipe I think I spotted here, that used paprika instead of creole seasoning... I can imagine that being just as good as this, without the creole-ness... Not a big fan of spicy. I do have another recipe on the blog with paprika instead of creole seasoning. I like both. This wasn't spicy - just flavorful. Thanks Larry! It tasted even better. I can't stop thinking about this sandwich!! This looks awesome gonna try it!! I have an easy pretzel bun recipe on my recipe page that makes a ton of buns I & they're better than store bought, ur welcome to use it. forgot where i found the recipe but i have a link to it on the recipe page. I'll check out your pretzel roll recipe. I love pretzel rolls, but I've never tried to make them at home. Can you please share the link for the pretzel bun recipe? I'm gonna try this ckn recipe looks super tasty!! I loved that you served these on pretzel buns, they look perfect! I can not wait to try this!!!!!! Man that sounds like a great sandwich, Stephanie, and so easy too. How can you beat that? I made this for dinner last night and my husband loved it! So did I. :). This one is going in the rotation. It's great even without the bun. Just made these....ok well made me marinade like two weeks ago and froze some chicken thighs in it, but just cooked them tonight and they were outstanding. The Dijon we used was extra spicy so they had a kick but my husband is still moaning about how great they were! This is a dang good marinade. Made this with eggplant "buns" and smokey honey aioli. To die for. And the chicken alone is so good!